Kerala University UG First Supply Allotment results List Announced on 16th july. Hence candidates applied for Kerala UG admission can stay checking the official website, admissions.keralauniversity.ac.in. 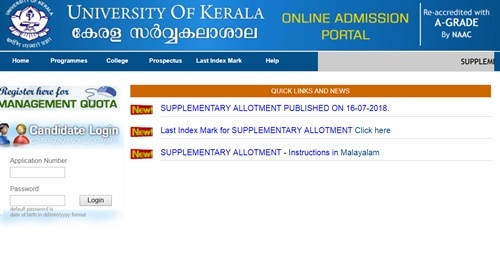 The Kerala University will be released the Supplementary allotment results today. Candidates seeking admissions in Kerala University have filled their choices. The University of Kerala Announced the 10+2 Fourth allotment results On 4th july. Students can keep checking the official website for further details regarding the Kerala University Degree 1st supplementary seat allotment results. Kerala University is one of the well-known universities in the state. The Kerala University offers admissions into various Undergraduate and Postgraduate Degree courses for the students. The KU offers various UG and PG courses such as BA, B.Com, B.Sc, MA, M.Com, M.Sc, and others. Annually large number of students gets certification from the Kerala University. The university follows the semester system in conducting the examinations, that is the academic examinations will be conducted yearly twice. The KU offers admission for students based on their merit obtained in their previous academic records. Students can check the details of Kerala University UG 1st allotment 2018 details from the following. Fourth allotment for various first degree programs in the affiliated colleges under University of Kerala is published in the admission website. Applicants can check their allotment after logging into the site http://admissions.keralauniversity.ac.in, using their application number and password. Candidates who have got allotment for the first time need to pay University fee through online mode or using fee remittance chalan which is available in admission website after login. University fee for general category is 1525 and for SC/ST category is 840. Those candidates who have already paid University fee and confirmed their seat after getting allotment in First allotment, need not pay the fee again. Applicants who are remitting the University fee through Chalan mode, should download the University fee remittance chalan from admission website and remit the fee in any branch of State Bank of India and enter the fee remittance details in admission website to download allotment memo. Allotted candidates can take admission to the college as per their allotment memo from 2018 July 5 to 7. (For more details, see allotment memo). Candidates who got allotment for the first time in this allotment can download allotment memo from admission website only after the payment. The details such as allotted college, course, category and the date for taking admission will be available in the allotment memo. Applicants have to take admission in the college/ course mentioned in the allotment memo with original certificates to prove their eligibility (For more details, see allotment memo). Those who are NOT satisfied with the allotted seat must anyway take admission in the college in order to be considered eligible for future allotments. Candidates who got allotment to their higher options, need to download the allotment memo from admission website and take admission to the newly allotted college/course after taking TC from currently admitted college/course. The allotment will be automatically cancelled of those candidates who fail to take admission in the specified college/course in the date and time mentioned in the allotment memo. Such candidates will not be considered for future allotments under any circumstances. Applicants who are satisfied with the current admission can cancel their higher options till 5PM on 07.07.2018 by logging into the website. Those higher options which are not cancelled will be considered for future allotments and the candidates will then have to accept the newly allotted seat. Students have to pay the remitting fee either online/offline. The offline fee can be paid through challan in State Bank of India. The special Chalan of Kerala University available in the ‘Allotment’ page of valid applicant’s homepage in the website admissions.keralauniversity.ac.in. Or students paying the remitting of fee through online can pay it directly using any debit/credit cards. Candidates must carry the the original pay-in-slip while reporting at the college. Candidates can download allotment memo by logging in to the official portal. Students who have paid the remitting fee can download the allotment memo. After giving the details of the prescribed programme, students can download the allotment memo. Students have to submit the allotment memo at the time of admission. Students can Cancel/active the options after the Second allotment. Students can opt up to 20 colleges for the admission. If students selected 20 options from the list only 1 to 9 options will be considered and rest of the options will get canceled automatically. Students will be provided with various options such as “CANCEL”, “CANCEL ALL HIGHER OPTIONS”, and “ACTIVATE”. Students proceeding for second/further allotment can check the details about remittance of fee details from the clause 8.2.1. Eligibility certificate from the University of Kerala in case of candidates who have passed qualifying examination other than HSE/ VHSE conducted by Government of Kerala or the examination conducted by CBSE and CISCE. Print out of completed online application generated by the Candidate. Original certificates to prove the claim for grace marks if any. Income certificate in the case of SEBC/ OEC candidates.